Novi Grad (Serbian Cyrillic: Нови Град) is a town and municipality located in the northern portion of Republika Srpska, an entity of Bosnia and Herzegovina. The town is situated on the Una river on the border with Croatia (opposite the town of Dvor). As of 2013, it has a population of 27,115 inhabitants. The town was once known as Bosanski Novi (pronounced [bǒsanskiː nôviː]). The municipality of Novi Grad is situated in the northwestern part of Republika Srpska at 45°08′N 45°32′E﻿ / ﻿45.14°N 45.53°E﻿ / 45.14; 45.53. It has an area of 470 km2 (180 sq mi). The municipality lies between the Sana and Una rivers, between the mountains of Grmeč and Kozara. The climate is temperate continental. The town was first mentioned in 1280 under the Latin name Castrum Novum which, literally translated, means 'new fort'. In 1895, during Austro-Hungarian rule in Bosnia and Herzegovina, the town was officially given the name 'Bosanski Novi'. At the same time, the city included around 3,300 people with 550 households. Wooden bridges existed across the Una and Sana rivers which the citizens had to guard against floods in the autumn and spring. For that reason, a current-day symbol of the town was built in 1906—the Una quay. In 1872, Novi Grad was the first municipality to have a train station on the new Bosnian railway, which afforded it significant cultural and economic advantages over other Krajina municipalities. The first hospital was established around the same time. From 1929 to 1941, Novi Grad was part of the Vrbas Banovina of the Kingdom of Yugoslavia. From 1992 through 1995, the town was ethnically cleansed of its Bosniak and Croat inhabitants, thereby rendering it almost completely Serb-populated. In order to distance the town from its Bosnian history and its cultural roots and in tune with the war politics, the local Serb government renamed the town to Novi Grad, a change criticized by Croat and Bosniak residents. Consequently, majority of people from Bosanski Novi were misplaced and live all over Europe, the American continent, Australia and elsewhere around the globe. 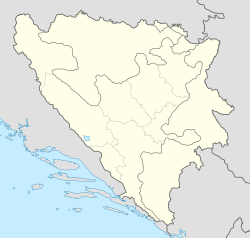 After the Bosnian war, Kostajnica was split from the municipality. According to the 2013 census results, the municipality has 27,115 inhabitants. The economy is based on a few industries and a number of private firms. Novi Grad has notable potential in tourism, wood processing, food production and management of water resources. There are several active sports organizations in the town, including football, handball and basketball clubs. The local football club is FK Sloboda Novi Grad. Wikimedia Commons has media related to Novi Grad. ^ the official web site of the municipality, Novi Grad/Нови Град. ^ a b "Popis 2013 u BiH – Novi Grad". statistika.ba (in Bosnian). Retrieved 29 December 2018.